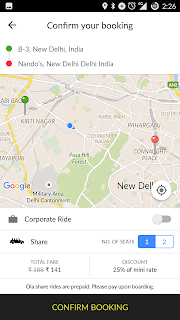 as I see it: App-based Taxis - Fare game? App-based Taxis - Fare game? 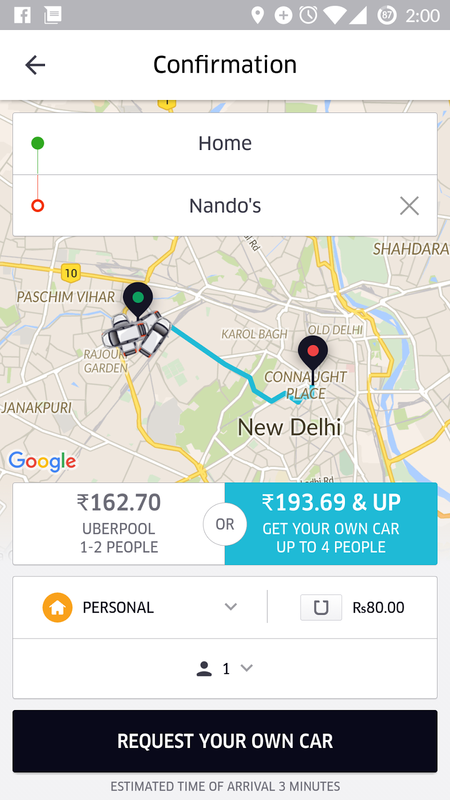 I was looking for an Uber to go to Nando's for lunch when I noticed something peculiar around the estimated fares and went back and forth on Ola and Uber apps to dig bit deeper into what I saw and then eventually thought about writing a detailed post around The Fare Game. I hope almost everyone is aware of this fact but still would briefly like to cover the difference between the fare advertised by Uber and Ola as compared to what it actually turns out to be. I will be taking Delhi as an example. 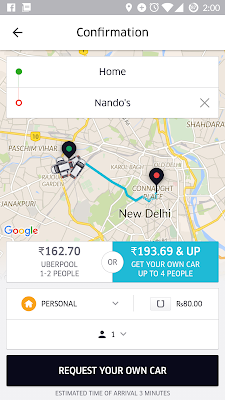 Trust most of you know that post the latest rate cut by Uber both Uber and Ola now have offerings starting Rs. 6/km. Even if you're not aware, they are likely to bombard you with the message over the next few days/week. Now, its easy to miss the small '*' next to the advertised fare which, in a way, conceals the fact that the real fare is much higher than what you see and at the same time shields away any legal trouble. And when I say much higher, I mean as high as TWICE of what is advertised or even higher and then of course there is Surge Pricing. 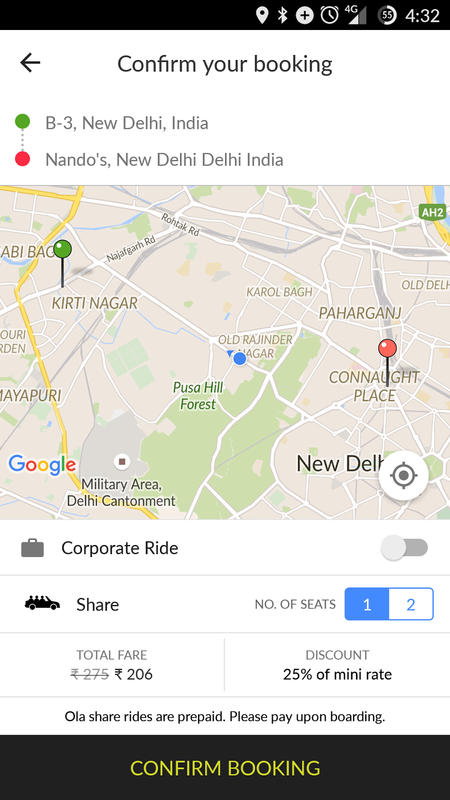 Here, is the fare calculation for Uber for a 10 km ride. Ola has exact same fee structure for Ola Micro and hence the exact same calculations. 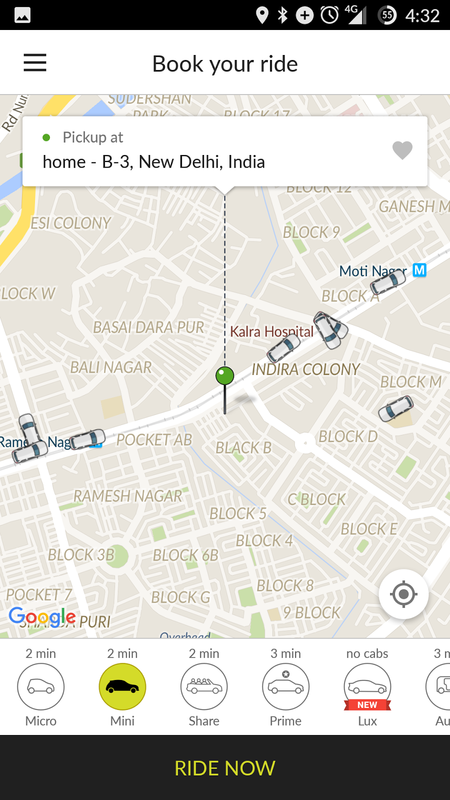 UberX and Ola Mini come to around Rs. 18 per km on doing similar calculations. Bottom line, forget being cheaper than, they are not even equal to auto fares. But yes, you have to give it to them, they are more comfortable and easy to call for. Point 1 is kind of obvious at a macro-level in the sense that when there is surge on UberGO/Ola Mini then even the pool/share rides will be expensive but I have never been able to see direct correlation. Point 2 is what I've myself observed many a times. You move your pickup location by a few metres (not kms but barely a few metres which is any way practical because almost always you board the cab after taking a few steps from the actual pickup location that you entered while requesting for the cab). This variation used to be significantly high couple of months ago but greatly reduced now. Point 3 is what I stumbled upon while digging deeper on the actual trigger that made me write this post. Given below are 3 screenshots taken for Ola Share from same pickup location to same destination at a gap of 2 hours. The distance between the 2 locations as per Google Maps is 11 km. With the source and destination as same and no peak/surge pricing in play (Pic 3 shows that there is NO Peak pricing), how can the fare be so different? Estimated price/km moving from Rs. 17 to Rs. 25! UberPOOL would have costed me exact Rs. 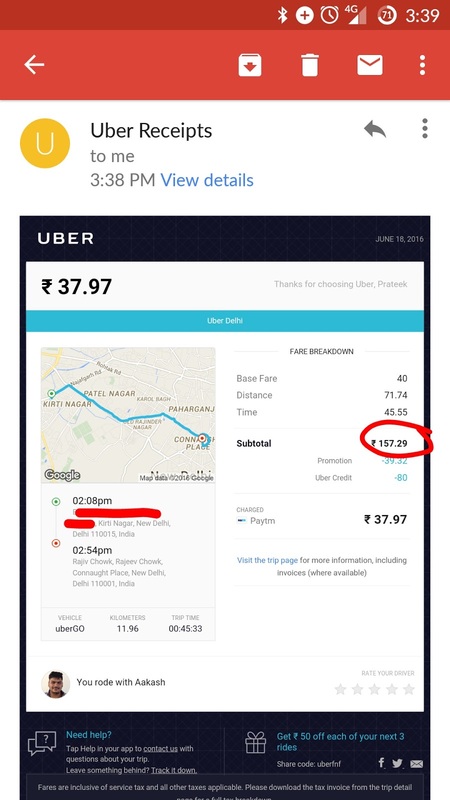 162.70 and an UberGO would have costed me in excess of Rs. 193.69. 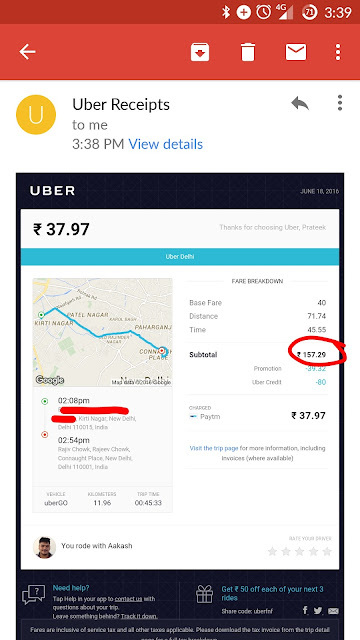 A simple division of that number by 11 km (distance between the 2 places) suggested that the UberGO fare being shown was much higher than the Rs. 13.5 per km that I use for my estimations. Rs. 40 + Rs. 6 * 11 is Rs. 106 and it just cannot take me 90 mins for a 11 km ride on a Saturday afternoon (I frequent this route and I also checked Google Maps)! Also, Rs. 193.69+ in theory is thrice that of the advertised fare (Rs. 17.6/km vs Rs. 6/km). Something was grossly wrong. Add to it, that UberPOOL was less than 20% of a discount (not good enough to accommodate a co-passenger and add to my overall trip time), I decided to opt for UberGO. Yes, the actual fare for UberGO was LOWER than what I would have paid had I opted for UberPOOL. If this was a genuine error by the software, one cannot be sure for how long has it existed, where all has it existed, how many erroneous calculations has it made. All said and done, it's something which is not acceptable from a "technology company". 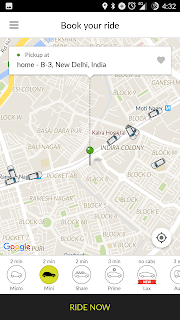 I just hope that it is not an effort to encourage UberPOOL by discouraging UberGO by showing higher estimated fares. Maybe UberPOOL is a metric of importance for them (Uber's plan to get more people into fewer cars). Also, my conspiracy theory loving brain started with calculations and found it to be financially more rewarding (charging a fare similar to that of UberGO on UberPOOL gives them a clear opportunity to earn much more than an UberGO trip in form of a potential second rider). I genuinely hope that this was a one-off error in estimation and doesn't happen again. Whatever be the real reasons behind these, all I can see is that there is a clear lack of transparency in pricing and price estimations which are likely to make people skeptical. A free first ride and advertisements showcasing messages of Rs. 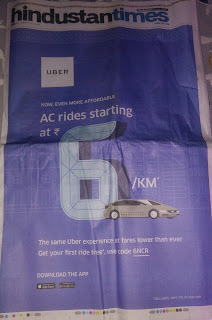 6/km and 'cheaper than auto' may help recruit a first time rider successfully but is more likely to create dissonance and mistrust in that rider eventually on subsequent trips and could lead to potential lapse. Add to this the perennial debate on how surge pricing works and the mess becomes messier.